This architect designed beach house plans are perfect for a beachfront block for ocean views and outdoor alfresco entertaining. The layout of the beach house plans demonstrate passive house design principles to deliver a slightly elevated ground floor living platform and cantilevered alfresco area to allow occupants to peer over the native coastal dunes to embrace the big ocean sky. The beach house plans provide 280 sqm of open-plan single storey design so you can harness views and northern aspect from the comfort of your open plan kitchen/living and dining. 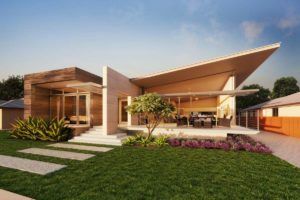 Wherever you are in Australia, the beach house plans will connect owners to the unique ocean vistas and coastal landscape with the added benefit of incorporating passive house design principles for thermal comfort. 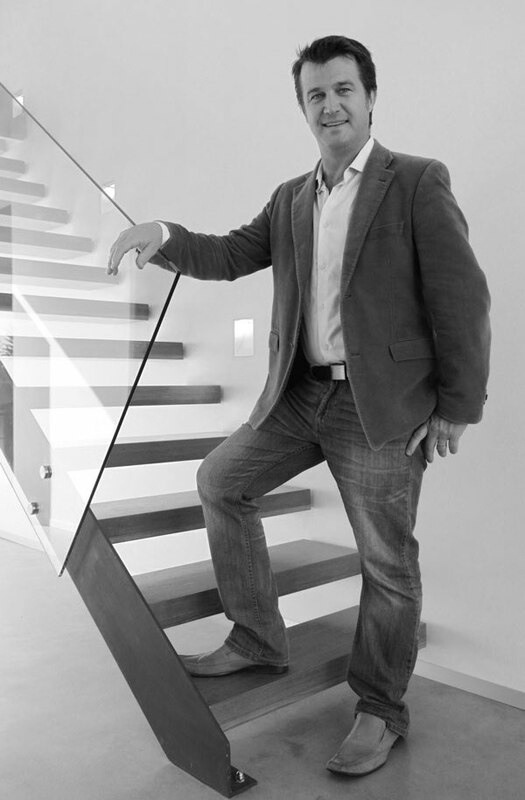 As a registered architect in Western Australia and South Australia, and registered builder in both Western Australia (BC 102904) and South Australia (BLD 289719), Stuart can deliver an architect designed sustainable home that enriches your daily life and will be a delight to inhabit. We’re enthusiastic about working with passionate architectural patrons who desire spatially distinct buildings and seek architectural excellence. The practice seeks to deliver designs that are functional, memorable and cost effective so if you wish to elevate the your experience of space, enquire today. The beach house plans incorporate 300mm thick rammed limestone flat arch walls which frame the polished concrete floors to create a relaxed beachside feeling with a clear stain finish plywood raking overhead ceilings. The Woodform Architectural Sorrento Burnt Ash cladding wraps and extend into the master bedroom to bring the raw natural surroundings inside. The beach house plans include a Chazelle Chimneys double-sided and dual opening firebox to the corner of the living area and the built in barbeque to the outdoor alfresco balcony which are framed by the textural delight of glass face render. The dual pitch skillion roof with plywood stained ceilings and eaves invite sunlight into open-plan living areas during winter in accord with passive house design principles to create a sophisticated aesthetic. The high raking ceilings and window head frames of these beach house plans reflect passive house design principles to allow the family to bathe in a warm, diffused light while the door head height sun awning protects the living areas from the harsh afternoon summer sun. These beach house plans create a point of difference with porcelain panel bench tops of the architect designed kitchen which are framed by a bench height slot window which doubles as the kitchen splashback. 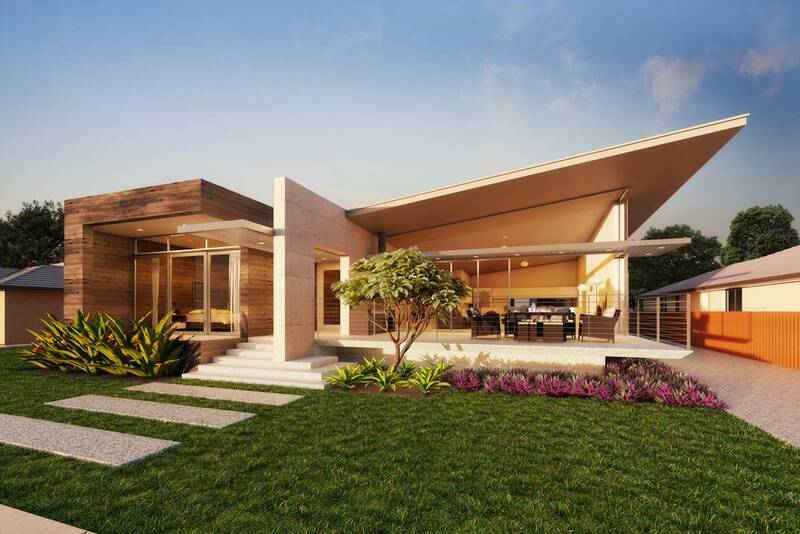 The beach house plans epitomises Australian indoor outdoor living and quintessential beach lifestyle on the coastal dune fringe utilising passive house design principles. Architectural house designs can be modified to your specific site requirements and personal preferences on cabinetwork, paint, tiling or fixtures and fittings – there are a variety of available finishes and specifications. We understand bespoke design and every client’s taste is unique so each architectural house design can be personalised to your personal lifestyle.